Many churches focus big energy on the weekend crowd. While it’s always important to gather and worship well, it’s a huge mistake to do so to the neglect of developing leaders who will fuel a disciple-making movement. Churches that excel at developing leaders move well beyond a a few training classes and pay attention to the leadership culture. Here are a few simple ideas for creating a leadership culture from a book I wrote entitled Building Leaders. #1 Provide “No-Draining” Training: Cancel all other ministry meetings, small groups, etc. the week that leaders gather for training or development. It will make a huge statement to your church and provide sanity for your leaders. #2 Create a Leadership Glossary: If you church has a clear vision and distinct culture, you probably have some unique vocabulary. 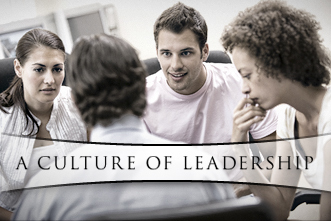 Make leaders feel welcome and speed up the process of enculturation with this tool. #3 Target Leaders with Social Media Content: Start a leadership blog, facebook group or twitter account targeting the leadership community in your church. Ken Werlein at Faithbridge, a church in Houston, creates a 10 minute podcast twice a month, just for the leadership community. #4 Expand the “Shallow End” of the Pool. Emerging leaders need to know there is a time and place to get their feet wet as it can be intimidating to be a newbie. Double the invitations and the opportunities just to attract new and potential leaders. Create a new leaders orientation experience and make it safe for potential leaders to sprout their wings! #5 Do a Message Series on Influence and Highlight Individual Leaders in Your Congregation: Reinforce the expectation that all believers should have gracious influence. In addition, clarify that some believers have a special leadership gifting (Romans 12:8). Honor lay leaders in the series (and all the time) who model influence well. #6 Ignite the Practice of Apprenticing: Many church’s aspire toward apprenticing but few follow through. First make apprenticing a primary “bullet” on any paid staff role description. Second, train and role play how to invite someone to be an apprentice with your existing leaders. #7 Give away a Great Leadership Book: Encourage everyone in your church to go through it. Consider a classic like Oswald Sander’s Spiritual Leadership, or Robert Coleman’s Master Plan of Evangelism. A good new book you might consider is Exponential by Dave and Jon Ferguson. If you don’t have the budget, consider significantly offsetting the cost. #8 Plan an All-Leaders Summer Retreat: Get together and have fun. Remember you can’t create a culture unless the leaders form a “leadership identity” together. How many times have all the leaders in your church spent time together? #9 Interview Leaders as a Staff and Ask them How the Church Can Add Value to Leaders: Stop assuming you know what leaders need in your church. Just ask. They will be glad you did. Follow-up this focus group style with a survey to all leaders to get further input. #10 Expand the “Deep End” of the Pool: If your “leadership pool” is only 4 ft. deep, then your highest capacity leaders won’t find a place to swim. Make sure you create special opportunities and make unique invitations to get the “level 10” leaders engaged. If you don’t have the highest level leaders (10’s) you won’t attract the 7’s 8’s and 9’s who want to swim deep in your leadership community. What have you wanted to get done but lacked the horsepower? Maybe its time to take a risk and ask a new “big dog” leader to tackle it.